Did you know that when you generate a lead online they are already over half way to their purchasing decision? According to research, 57% of their decision is already made. Now, it's just up to you to tip the scales further in your favor. 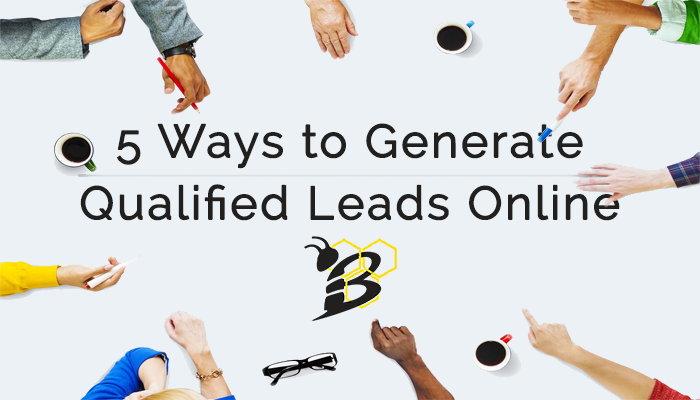 Let's take a look at 5 ways to generate qualified leads online for your business starting today! We all know how valuable SEO strategies can be in generating leads. There are very few businesses that can't benefit from a strategic SEO approach for their website. Being found organically through search results is also one of the best way to reach a lead online. Now let's look at some dos and don'ts of SEO use. If you service customers locally or have a storefront, local SEO is an absolute must. This will include directory listing, local keyword focus, and reviews, among more traditional SEO tools. If you haven't already developed your target personas, download our FREE Buyer Persona Worksheet now! We highly encourage the use of tools such as SpyFu and Moz to get a better understanding of the successes and failures of your competition. This can include choosing to focus on keywords with high competition, very low search volume, or even keywords that are not common for your target personas to use. It's important to not use your target keyword more than five times in your content to avoid keyword stuffing triggers by search engines. We recommend not using more than one keyword per 100-150 words as well. While search engines have evolved and are much smarter than they've ever been, developing content that doesn't at least assist in appealing to your target personas does no good in generating leads online. Another way to gain qualified leads is by hosting online webinars. This is an inexpensive way to reach many of your potential consumers by sharing your insights and knowledge while also giving your brand a personality. Determine what your target demographic is most interested in, and speak to it. You can increase your access to qualified leads by doing a series of webinars. For instance, have a 5-part series on a topic of interest to your target personas. This strategy keeps your viewers engaged and coming back for more. And at the conclusion of each webinar, ask viewers to sign up for a newsletter, visit your site, or download available resources. Blogging enhances the chances of gaining qualified leads because it speaks to the customer's needs, wants, interests, or concerns. A successful blog will focus only on being helpful and educational to those that you'd like to attract. Blogs allow your company to have total dominion over the content and what's communicated, as well as receiving the reader's undivided attention. Use the margins to promote your products or services. And have an option to sign up for a newsletter or email list for more information. If you're not sure how to get the most out of your blogging efforts, we've developed a FREE Blogging Checklist to assist! Download it now! Videos are great tools because they allow for an eye-to-eye connection with your potential customers. They're able to see you as a human being more easily through this method of generating leads. Showing that your business or brand has actual people behind it and has a personality helps to develop trust and expedites your path to being viewed as an authority in your industry. Focus on engaging your leads and being entertaining in the process. Promote your business through personable engagement and thought-provoking questions. It's important to note that some social media sites warrant more frequent posts than others. Twitter is one that increases effectiveness the more you Tweet, as long as you space out your Tweets. We've never met a company that didn't want to generate more leads online. By employing some of these inexpensive tools, you can start to develop more and more leads as your campaign grows. Filling your pipeline is the key to long term success and business growth. Before a digital campaign can be successful, a solid strategy is a must. Let us help you develop an in depth and actionable strategy that can guide all efforts in the future with the HIVE GrowthPlan!